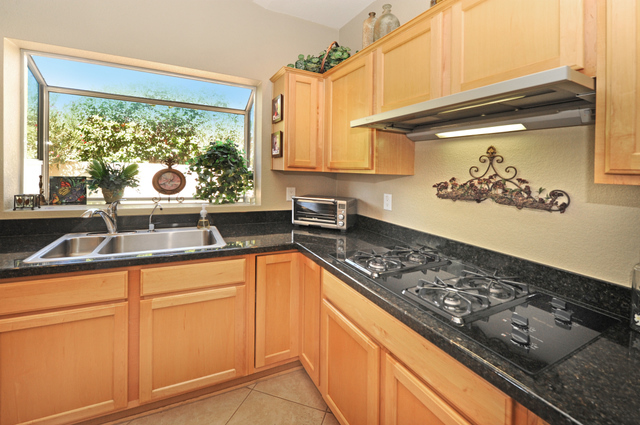 24934 Stoney Lake, Sun Lakes AZ, 85248, MLS 5167953 is the Kolb Team’s newest listing. Expect to be impressed with this 3 bedroom, 3 bath home with separate guest house, stone finish to exterior front and courtyard and stunning golf course, water and mountain views. The sellers think you will love some of the things they love about this home such as no golf cart path running close to the home and no golf balls since they have owned the home. That is largely due to the premium lot that is situated on the Palms #6 tee box. Beautiful golf course, water and mountain views from the patio and privacy with lush landscaping and natural gas fireplace with bench seating adjacent to the pool. 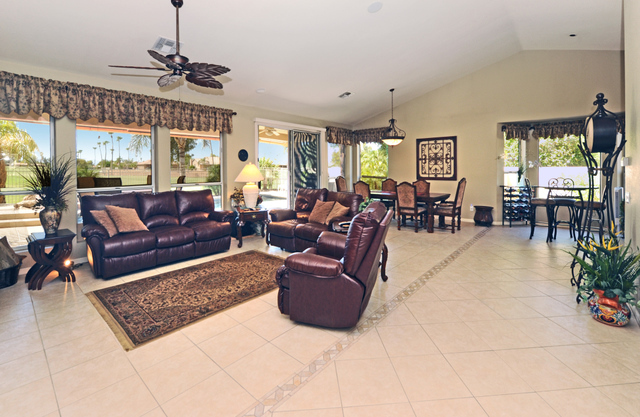 This home is in the newest of the Sun Lakes Arizona active adult community in the IronOaks homeowner association. The great room offers great views to the backyard oasis and golf course and the kitchen is spacious with a large island, black granite, maple cabinets with sliders, gas cook top, stainless appliances and plenty of storage area. They also love the spacious master suite with sitting area that overlooks the lush private area of the patio. Great place to sit and read, watch a television or just relax. The master bath has been completely remodeled with raised height counters, quartz counter tops and a custom over sized glass block shower that is fully tiled. The walk in closet is huge with built ins. Guests will love the separate guest house with walk in closet and private bath. The courtyard separates the main house from the guest house and provides an excellent and private location for sipping morning coffee and catching up on the news. 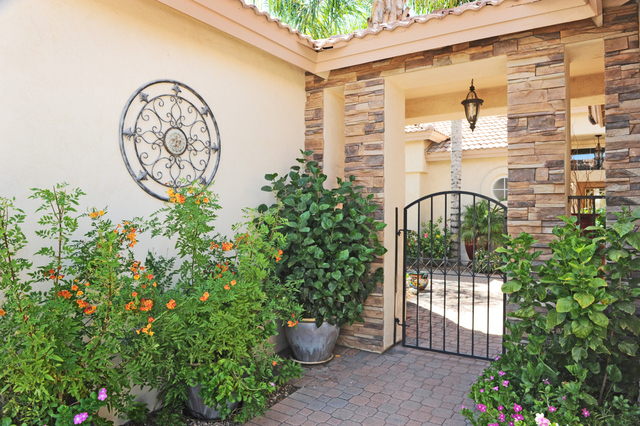 One of the best features of this home is the backyard – it’s like having your own resort oasis! The pool was completely remodeled in 2013 with new plumbing, pebble tec, variable speed pump, waterfall and heater added. Posts were removed from the patio area to offer more expansive views. A retractable awning provides plenty of shade and the south portion of the back yard was completely transformed as you will see below. 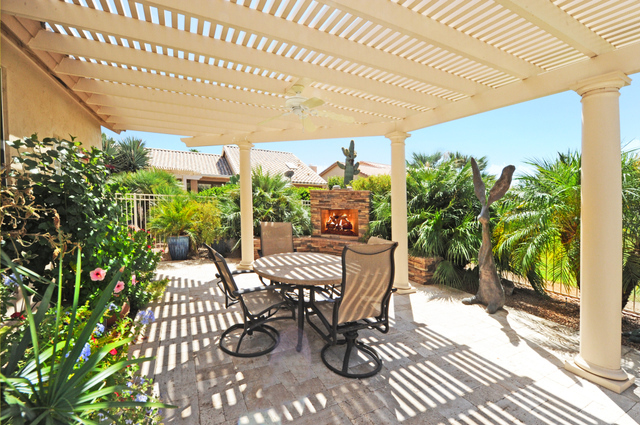 A shade structure, travertine flooring and step, natural gas fireplace with bench seating, lush landscaping and ceiling fan were added to make this private area great for entertaining, relaxing or outdoor dining. Conveniently located to Sky Harbor International Airport, Mesa Gateway Regional Airport, major shopping centers, all major freeways and the Price Road Corridor make Sun Lakes a top choice for active adult living in the East Valley of Arizona. Amenities include golf, tennis, pickle ball, fitness center, restaurants, spectacular lakes and walking paths and many opportunities for social engagement with friends and neighbors.